All electrical boxes must have covers. All non-metallic sheathed electrical wiring* should be behind sheetrock. This application could have been completed with BX cable or conduit. 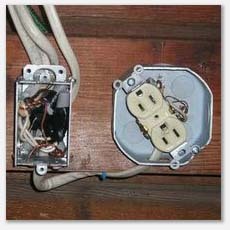 You should never see an wire nut, they should always be in junction boxes with proper covers. If these connections were to fail, there is nothing to contain the potential sparks and could result in a fire. This was an example of handyman wiring and made us conclude that it was not performed by an electrician and not inspected by a municipal inspector. We noted this as unprofessional wiring. It is a non-metallic sheathed electrical wiring that everyone in the trades has simply called Romex® for years. Builders, electricians, home inspectors and home owners have all used this name for this type of wire. These people are scumbags, threatening me for using the name Romex®. I have installed and recommended Romex® for years, no more! Avoid them. Rome Cable Corp. of Rome, NY. Shame on you Southwire!!! Scumbags!